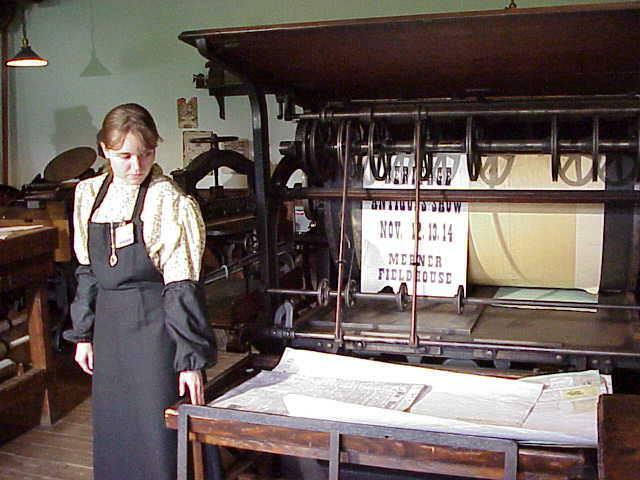 The Print shop was a center of news in the nineteenth-century Naperville. Print shops in small communities like Naperville published the local newspaper and produced everything a customer might need on paper. Clients ordered calling cards for social visits, wedding invitations, custom stationery, handbills, posters and advertisements. The print shop was also a spot for socializing. Anyone who had been out of town stopped by the newspaper office at the print shop on their return to catch up with the news and gossip they missed while they were gone. Naperville master printer David Givler published the “Naperville Clarion” newspaper from 1867 to 1905 under the motto “Neutral in Nothing; Independent in Everything.” Like many small-town publishers, Givler was also the reporter, editorial writer and editor for his weekly paper. When he retired, his son Rollo N. Givler took his place. The “Naperville Clarion” closed shop in the 1970s. Harold and Eva White published and edited the community’s other major newspaper, the “Naperville Sun,” from 1936 through the early 1990s. This Naperville garage was built in 1929 between Eagle and Webster Streets (north of Aurora Avenue). 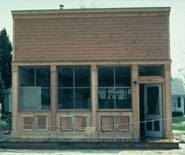 In 1981 it was moved to Naper Settlement and transformed into the Print Shop. Our sincere appreciation to the donors and volunteers who contributed their time, resources and equipment to make the Print Shop at Naper Settlement an operating newspaper and job printing shop again. View all volunteers and donors who contributed to the Print Shop.